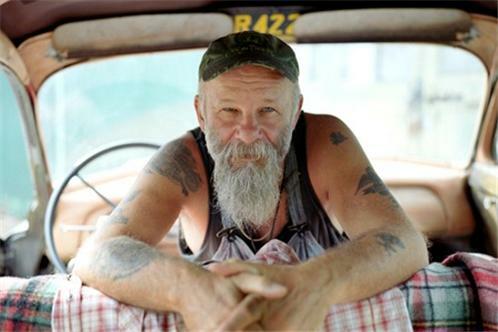 Steven Gene Wold (born 1941), commonly known as Seasick Steve, is an American blues musician. He plays (mostly personalized) guitars, and sings, usually about his early life doing casual work. In the 1960s, he started touring and performing with fellow blues musicians, and had friends in the music scene including Janis Joplin and Joni Mitchell. Since then, he has worked, on and off, as a session musician and studio engineer. In the late 1980s, while living in Olympia, near Seattle, he worked with many indie label artists. Kurt Cobain was a friend. In the Dutch newspaper De Telegraaf of May 31, 2011 Steve denied this, saying (in translation): "Just like everybody else I saw him pass by in the street and said hello to him. That doesn't make us friends, does it?". Regarding his 'friendship' with Janis Joplin (same source): "We both lived in San Francisco in the sixties. Period". In the 1990s he continued to work as a recording engineer and producer, producing several releases by Modest Mouse including their 1996 debut album This Is a Long Drive for Someone with Nothing to Think About.